The lesser grey shrike (Lanius minor) is a member of the shrike family Laniidae. 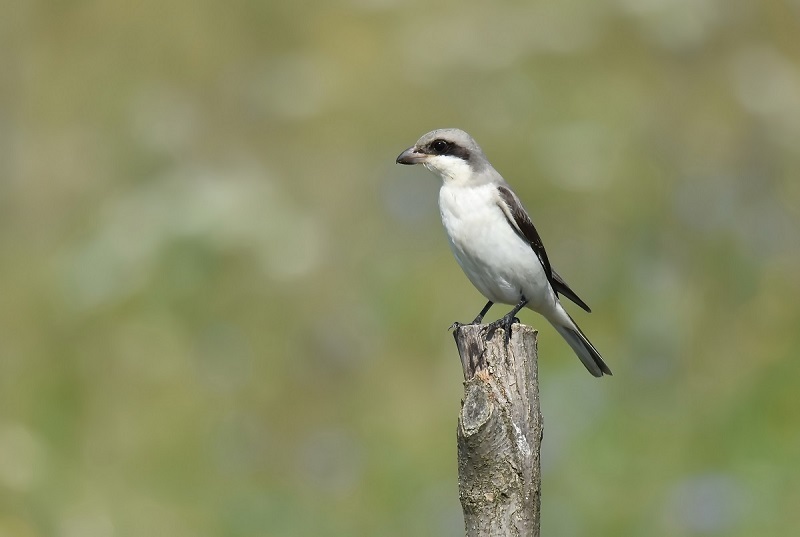 The lesser grey shrike spends the summer in South and Central Europe and western Asia. It breeds in southern France, Switzerland, Austria, Czech Republic, Italy, the former Yugoslavia, Albania, Greece, Romania, Bulgaria and southern Russia. In Asia it breeds in the Middle East, its range extending as far as eastern Turkey and Iran. It is a vagrant to more northerly parts of Europe, usually in spring or autumn. Countries where it has been seen include Sweden, Finland, Denmark, United Kingdom, Netherlands, Belgium and northern France. It is a migratory species and winters in a broad belt across tropical southern Africa. It is similar in appearance to the great grey shrike Lanius excubitor and the southern grey shrike Lanius meridionalis being predominantly black, white and grey, with the males having pink-flushed underparts. It is slightly smaller than the great grey shrike, and has a black forehead and relatively longer wings. This medium-sized passerine eats large insects, especially beetles, butterflies, moths and grasshoppers. Like other shrikes it hunts from prominent perches and sometimes impales corpses on thorns or barbed wire as a "larder". Excellent picture Marius! Very nice sharpness and super back ground! Very difficult sometime to get perfect shot when eyes are dark black. Well captured even white looks perfect. Beautiful background too. I like the colors in this photo. The background is eyecatching and the pose of bird is great. I see a sharp eye and a twinkling. That's how it should be.